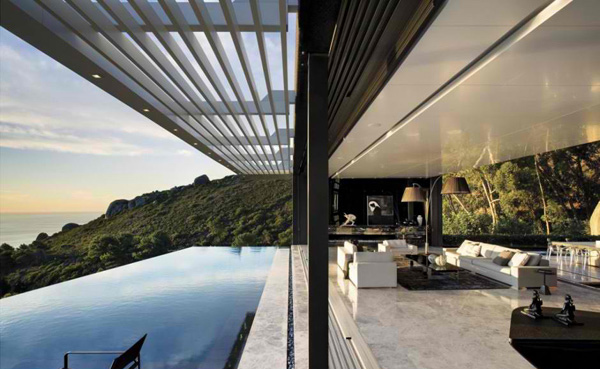 The Nettleton 198 is a seven-level home with six bedrooms and a wonderfully made interior and exterior cladding which makes the home highly modern and outstanding for a home by the mountain which enjoys a spectacular view of the sea and the Lions Head. The designers of this awesome home made most of the site and made sure that no view will be put to waste, if you know what I mean. The lower levels of the house were remodelled while the upper levels were demolished to achieve the design of the home that we can now admire. The designers from SOATA or the Stefan Antoni Olmesdahl Truen Architect were able to determine that the sun was the major contributor to the overall design, both defining the structure and at the same time a harsh influence. With that, the choices for the shutters, screens and louvers were drawn to integrate how the sun actually affected the indoors with its rays and heat. The home is definitely one to envy because of the details that looks too effortless with its natural backdrop – the mountain. Dark colors were used in the facade which allowed the building to blend in with the mountain instead of being too bold to obstruce the beauty of nature. So, let us take a look at the uniqueness of this home through the images below. Admire how modern this house looks with all the lines and and the dark cladding with the lights making the house charming. 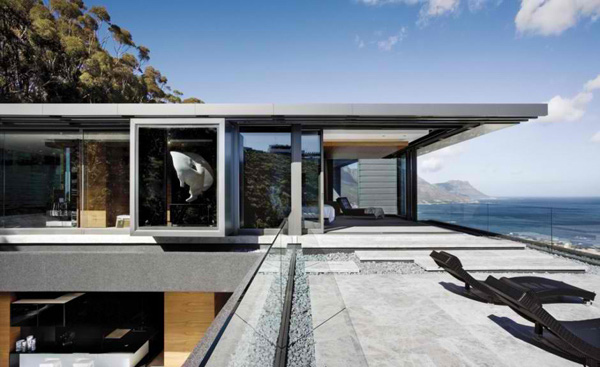 Since the house is made not to obscure the view that the site has, the designers made sure that the house is able to take advantage of the sky and the mountain as a whole. 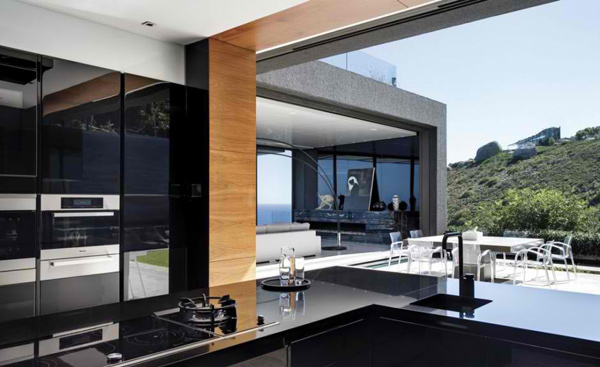 Admire how open the kitchen was done to be able to make the access easier for the outside part of the house. 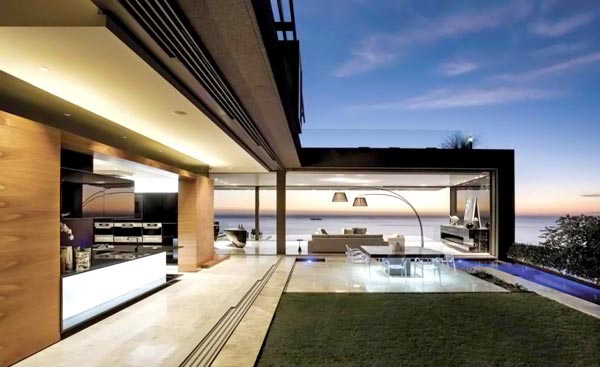 This living area gets to capture the entire view of the sky and the sea thanks to the open area designed by Stefan Antoni Olmesdahl Truen Architect. The circular entrance is decorated with a beautiful water feature that serves as the focal point of this area. Admire the stairs that also captures the look of a circular concept for this space. 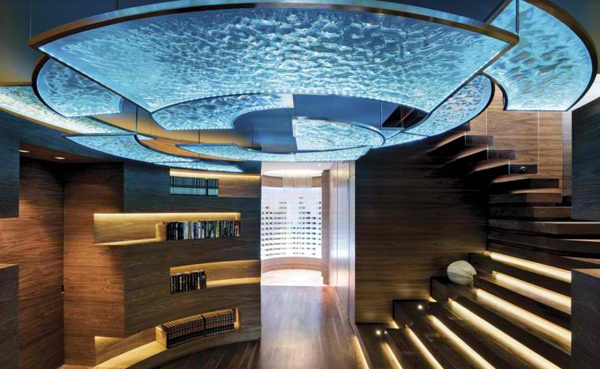 The walls looks so fascinating from this angle while looking at the center piece in the middle of the room. 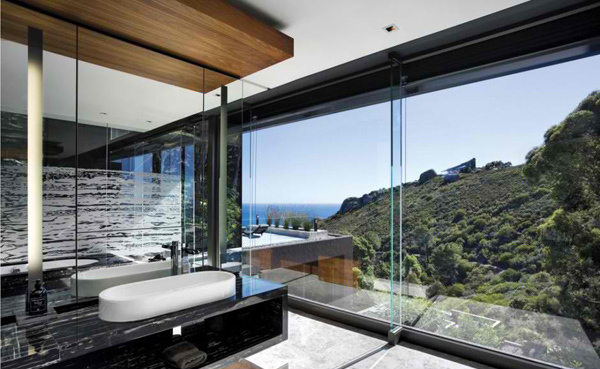 This picture of the toilet and bath is able to get a feel of nature thanks to the glass windows, and with the blinds this room has, the owners also get the privacy they need. 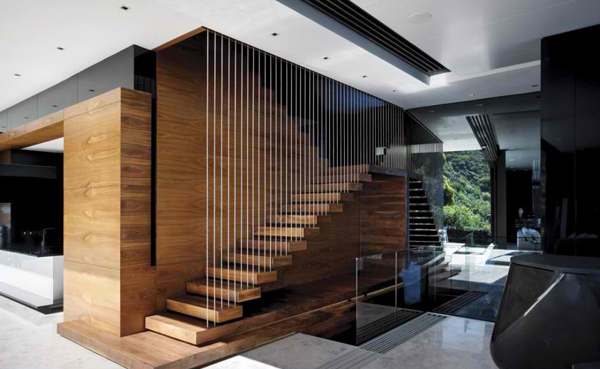 Isn’t it fascinating to look at this floating-like timber staircase with stainless steel rods for its balustrade? Look how wonderfully done this granite-clad rim-flow pool is. The view obviously makes the pool more lovely during the night. This area is usually used for sun bathing purposes located above the pool. 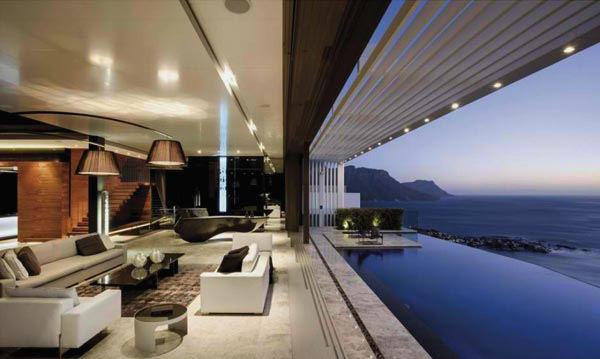 Imagine how attractive the pool is from the living area with the fascinating view of the sky and the sea. This setting gives you a feel of an open pavilion. Stefan Antoni Olmesdahl Truen Architect assisted the clients’ wish to make sure that the interior of the house is focused and minimal. The choices of furniture plus the good lighting added appeal and visual impact to the home’s interior. 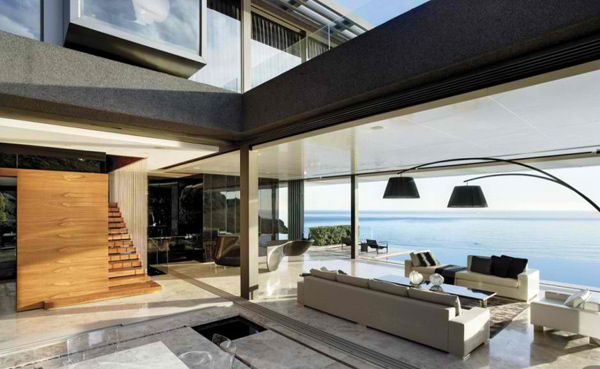 The interior was creatively done manifested by how they rendered the walls, ceiling and other features of the house. Every angle of the home shows a touch of uniqueness. The Nettleton 198’s finishing and details have been considered well since the designers wanted to achieve an integrated and effortless home for the client. 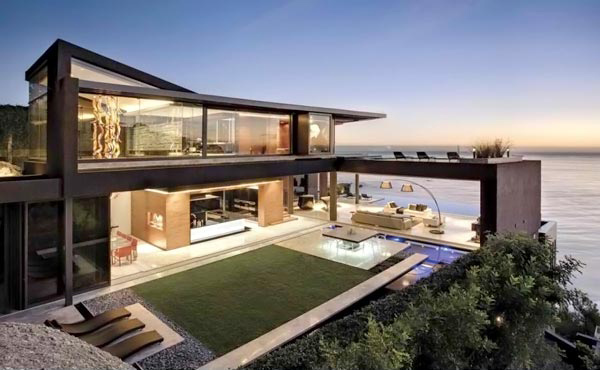 With aluminum cladding for the exterior of the house, and black marble, glass and walnut timber for the interiors, the house is indeed an amplified beauty. Check out the other works of art of Stefan Antoni Olmesdahl Truen Architect.